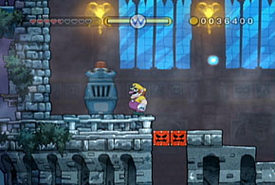 Bad Manor is the fourth level of the Quiver Cliffs and final normal level in Wario Land: Shake It! for the Wii and is based off of a typical haunted mansion. This level has many traps and undead enemies. This level also has a secret map to Boogie Mansion. In order to get it, the player must free the Merfle and Ground Pound down the hole, then keep going through the areas until reaching an area with a Max Fastosity Dasherator. The player should use it on the first set of blocks, then crash into the wall to stop. Then, the player should jump up and walk over to the next set of blocks and Earthshake Punch to reveal the map and end the level. This page was last edited on January 16, 2019, at 08:50.